Excited about taking your cruise from Port Everglades? Worried about missing the ship? Luckily there are a number of hotels (at all price levels) that are so close you can walk to — or even see — the port from your room. Why should you want to stay this close? In Fort Lauderdale, the port area is a happening place. There are restaurants, shops, and the beach all nearby. Add to that the fact that there is no rush come cruise day since you are so close to the port. You can sleep in, have a leisurely breakfast, and still have plenty of time to get to the ship. And if you’re wondering if you should stay at a hotel before your cruise at all, we highly suggest it for passengers flying in for their trip. When driving, it’s usually ok to arrive in the port city the day of your trip as there are unlikely to be delays long enough to cause you to miss your cruise. However, those who fly in face the risk of flight delays or cancellations due to everything from computer malfunctions to bad weather. And when you fly, you have no control over when you might arrive if there is a delay. That’s why you should always try to arrive at least the day before your cruise to allow plenty of time. 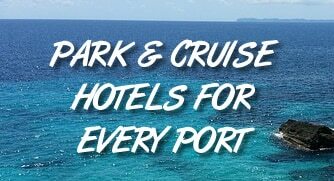 And if you want to stay near the port, we’ve found nine hotels that are extremely close to the cruise terminals. Most of these are located near the north entrance of the port, so close that you can walk on cruise day if you are sailing from one of the northern terminals. This hotel is a straight shot the the midport area, but a little longer if you’re sailing from one of the northern terminals. The Crowne Plaza also offers a shuttle service to the port if you don’t want to talk. Located on Highway 1, this hotel is just around the corner from the cruise port and a straight shot from the airport. It’s likely a little far to walk to the port but your ride shouldn’t be more than five minutes to the ship. Stay here and not only will you have a trendy upscale hotel, but you’ll also have access to a shuttle that runs to the port several times a day. The shuttle costs just a few bucks and is much easier than having to arrange your own transportation. In addition to being right near the port there are also a number of shops and restaurants within a short walk of this hotel. You can eat at Carrabba’s, pick up sunscreen at Walgreens, and get that bottle of wine at Total Wine before you make the short trip over to the cruise ship. An affordable option within walking distance of the port. This hotel is popular with cruisers who want to be close to the action come cruise day. It’s also one of the best options if you’re looking for affordability near the port. There aren’t many options that match the value of the Holiday Inn Express. It’s a short walk to the port but without spending a fortune like higher-end hotels a little closer. Those looking for high-end accomodations near the port are smart to look at the Renaissance. Due to its height, those staying at the top floors will also have a good view of the ships coming in and out. Among the absolute closest hotels to the port, the Hilton sits across the street from the convention center that marks the start of the port area. There are also a number of restaurants and stores within a short walk. A classic Fort Lauderdale hotel that features a tower overlooking the bridge and port area so you can see your ship before you head over to the port.